How to work with video objects? Third party libraries such as the Storyblocks or iStock Getty Images libraries contain millions of video objects you can use in your Moovs. Once you have dragged a video object from a library to the Stage, you can modify its presence and behavior in different ways. On the Stage, you can resize it, reposition it and rotate it in the same way as with other visual objects, like images. 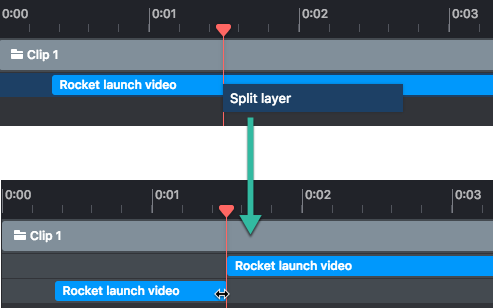 On the Timeline, you can split, loop or pause a video. Splitting can be useful if you wish to crop a video object. To split a video that is on the Timeline, you can right-click the blue time bar and select "Split layer". The video object will be cut in two and split over two layers. You can still adjust the edge by dragging it left or right (switch off the Snap function if needed for finetuning). Note: you can always make a video object shorter by clicking its right edge in the Timeline and dragging it to the left. When you want to use a video object for longer than its actual length, you can loop it. This might be interesting for background videos or videos with motion graphics or animations you would like to repeat for a while. When you use a video object in your Moov, it will play by default, from the first second. In certain occasions, you may want to pause a video, e.g. to freeze a frame and put other items over it (an arrow, a box, text...) to draw the attention to something. How to upload videos to the editor? 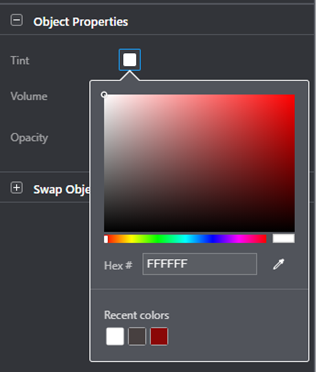 How to synchronize objects using the Snap function? 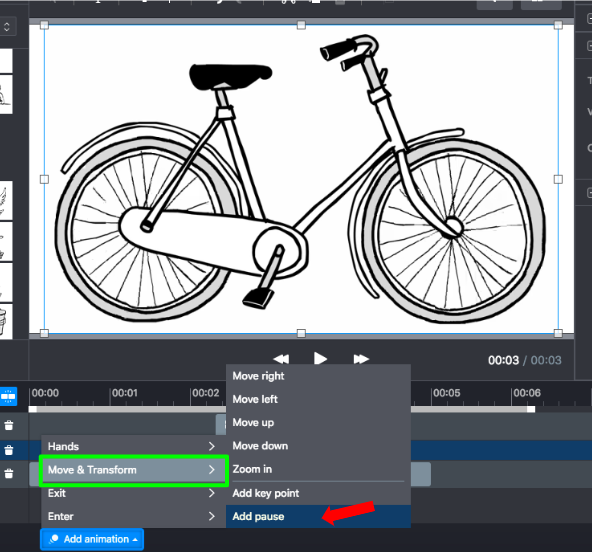 How to use the Move & Transform animation?